For other uses, see Chandelier (disambiguation). A chandelier /ˌʃæn.dəlˈɪər/ is a decorative ceiling-mounted light fixture, a distinct type of pendant light. Chandeliers are often ornate, and normally use incandescent light bulbs, though some modern designs also use fluorescent lamps or even LEDs. Crystal chandeliers have more or less complex arrays of crystal prisms to illuminate a room with refracted light. 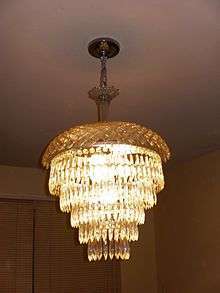 Chandeliers are often located in hallways, living rooms, dining rooms, and recently in bathrooms and bedrooms. The word chandelier was first known in the English language in the 1736, borrowed from the Old French word chandelier, which comes from the Latin candelabrum. One of the largest chandeliers in the world ever produced for the Al Ameen Mosque in Muscat (Oman) shortly before delivery. 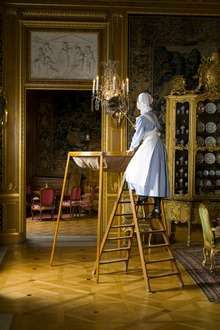 Housemaid cleaning chandelier in early-20th century Sweden. 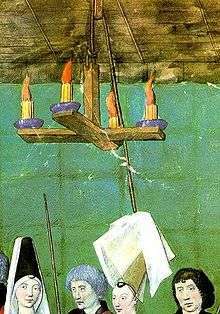 The earliest candle chandeliers were used by the wealthy in medieval times, this type of chandelier could be moved to different rooms. From the 15th century, more complex forms of chandeliers, based on ring or crown designs, became popular decorative features in palaces and homes of nobility, clergy and merchants. Its high cost made the chandelier a symbol of luxury and status. By the early 18th century, ornate cast ormolu forms with long, curved arms and many candles were in the homes of many in the growing merchant class. Neoclassical motifs became an increasingly common element, mostly in cast metals but also in carved and gilded wood. Chandeliers made in this style also drew heavily on the aesthetic of ancient Greece and Rome, incorporating clean lines, classical proportions and mythological creatures. 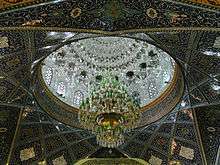 Developments in glassmaking later allowed cheaper production of lead crystal, the light scattering properties of which quickly made it a popular addition to the form, leading to the crystal chandelier. During the 18th century glass chandeliers were produced by Bohemiens and Venetian glassmakers who were both masters in the art of making chandeliers. Bohemian style was largely successful across Europe and its biggest draw was the chance to obtain spectacular light refraction due to facets and bevels of crystal prisms. As a reaction to this new taste Italian glass factories in Murano created new kinds of artistic light sources. Since Murano glass was not suitable for faceting, typical work realized at the time in other countries where crystal was used, venetian glassmakers relied upon the unique qualities of their glass. Typical features of a Murano chandelier are the intricate arabeques of leaves, flowers and fruits that would be enriched by coloured glass, made possible by the specific type of glass used in Murano. This glass they worked with was so unique, as it was soda glass (famed for its extraordinary lightness) and was a complete contrast to all different types of glass produced in the world at that time. An incredible amount of skill and time was required to precisely twist and shape a chandelier. This new type of chandelier was called "ciocca" literally bouquet of flowers, for the characteristic decorations of glazed polychrome flowers. The most sumptuous of them consisted of a metal frame covered with small elements in blown glass, transparent or colored, with decorations of flowers, fruits and leaves, while simpler model had arms made with a unique piece of glass. Their shape was inspired by an original architectural concept: the space on the inside is left almost empty since decorations are spread all around the central support, distanced from it by the length of the arms. One of the common use of the huge Murano Chandeliers was the interior lighting of theatres and rooms in important palaces. 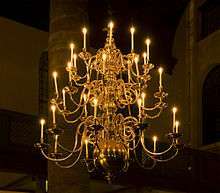 In the mid-19th century, as gas lighting caught on, branched ceiling fixtures called gasoliers (a portmanteau of gas and chandelier) were produced, and many candle chandeliers were converted. By the 1890s, with the appearance of electric light, some chandeliers used both gas and electricity. As distribution of electricity widened, and supplies became dependable, electric-only chandeliers became standard. Another portmanteau word, electrolier, was formed for these, but nowadays they are most commonly called chandeliers. Some are fitted with bulbs shaped to imitate candle flames, for example those shown below in Epsom and Chatsworth, or with bulbs containing a shimmering gas discharge. The world's largest English Glass chandelier,(Hancock Rixon & Dunt and probably F. & C. Osler) is located in the Dolmabahçe Palace in Istanbul. 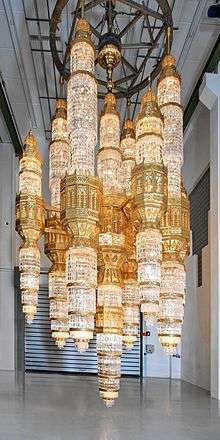 It has 750 lamps and weighs 4.5 tons. Dolmabahçe has the largest collection of British and Baccarat crystal chandeliers in the world, and one of the great staircases has balusters of Baccarat crystal. More complex and elaborate chandeliers continued to be developed throughout the 18th and 19th centuries, but the widespread introduction of gas and electricity had devalued the chandelier's appeal as a status symbol. Toward the end of the 20th century, chandeliers were often used as decorative focal points for rooms, and often did not illuminate. A neoclassical style, light, airy and elegant chandelier – usually English. The light-bearing part of a chandelier also sometimes known as a branch. The metal or wooden block placed on the stem, into which the arms slot. A bag of crystal drops formed by strings hanging from a circular frame and looped back into the center underneath, associated especially with early American crystal and regency style crystal chandeliers. A turned wood or moulded stem forming the axis of a chandelier, with alternating narrow and bulbous parts of varying widths. A glass drop with a hole drilled right through. Bobeche A dish fitted just below the candle nozzle, designed to catch drips of wax. Also known as a drip pan. Branch Another name for the light-bearing part of a chandelier, also known as an arm. Candelabra Not to be confused with chandeliers, candelabras are candlesticks, usually branched, designed to stand on tables, or if large, the floor. Candlebeam A cross made from two wooden beams with one or more cups and prickets at each end for securing candles. Canopy An inverted shallow dish at the top of a chandelier from which festoons of beads are often suspended, lending a flourish to the top of the fitting. Cage An arrangement where the central stem supporting arms and decorations is replaced by a metal structure leaving the centre clear for candles and further embellishments. Crown A circular chandelier reminiscent of a crown, usually of gilded metal or brass, and often with upstanding decorative elements. Crystal Glass with a chemical content that gives it special qualities of clarity, resonance and softness, making it especially suitable for cutting. For example, lead crystal. Drip pan The dish fitted just below the candle nozzle, designed to catch drips of wax. Know also as a bobeche. Drop A small piece of glass usually cut into one of many shapes and drilled at one end so that it can be hung from the chandelier with a brass pin. A chain drop is drilled at both ends so that a series can be hung together to form a necklace or festoon. Dutch Also known as Flemish, a style of brass chandelier with a bulbous baluster and arms curving down around a low hung ball. Festoon An arrangement of glass drops or beads draped and hung across or down a glass chandelier, or sometimes a piece of solid glass shaped into a swag. Also known as a garland. Finial The final flourish at the very bottom of the stem. Some Venetian glass chandeliers have little finials hanging from glass rings on the arms. Neoclassical Style chandelier Glass chandelier featuring many delicate arms, spires and strings of ovals rhomboids or octagons. Regency Style chandelier A larger chandelier with a multitude of drops. Above a hoop rise strings of beads that diminish in size and attach at the top to form a canopy. A bag, with concentric rings of pointed glass, forms a waterfall beneath. The stem is usually completely hidden. Soda glass A type of glass used typically in Venetian glass chandeliers. Soda glass remains “plastic” for longer when heated, and can therefore be shaped into elegant curving leaves and flowers. Refracts light poorly and is normally fire polished. Spire A tall spike of glass, round in section or flat sided. To which arms and decorative elements may be attached, made from wood, metal or glass. Tent A tent shaped structure on the upper part of a glass chandelier where necklaces of drops attach at the top to a canopy and at the bottom to a larger ring. Venetian A glass from the island of Murano, Venice but usually used to describe any chandelier in Venetian style. Waterfall or Wedding Cake Concentric rings of icicle drops suspended beneath the hoop or plate. ↑ "Chandelier". Dictionary.com. Retrieved 2 May 2014. ↑ "Chandelier - definition". Merriam-Webster. Retrieved 21 February 2015. ↑ Ruth A Johnston (15 August 2011). All Things Medieval: An Encyclopedia of the Medieval World [2 volumes]: An Encyclopedia of the Medieval World. ABC-CLIO. p. 450. ISBN 978-0-313-36463-1. ↑ "A History of the Chandelier". ↑ "An Introduction to Murano Glass Chandeliers". ↑ "Shedding Light on an Era; The Collection of Lighting Appliances in the 19th C. Ottoman Palaces"
Abbott James A., and Elaine M. Rice. Designing Camelot: The Kennedy White House Restoration. Van Nostrand Reinhold: 1998. ISBN 0-442-02532-7. Katz, Cheryl and Jeffrey. Chandeliers. Rockport Publishers: 2001. ISBN 978-1-56496-805-0. McCaffety, Kerri. The Chandelier Through the Centuries. Vissi d'Arte Books: 2007. ISBN 978-0-9709336-5-2. Parissien, Steven. Regency Style. Phaidon: 1992. ISBN 0-7148-3454-8. 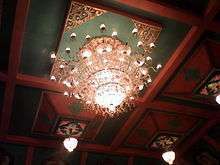 Wikimedia Commons has media related to Chandeliers. ↑ "Bathroom Lighting - Gustavian Bathroom lighting".